This niche book for history buffs and professional gardeners offers rich insight into how seed catalogs influenced the American obsession with social status. When Martha Stewart wrote about hydrangeas in her magazine, nurseries around the country sold out of hydrangea plants within days, proving that mass media can influence the general public to buy almost anything. In the nineteenth century, advertising had its first major foray into popular culture when seed catalogs sold the English gardening style to American homemakers. America’s Romance with the English Garden details the growth of the advertising and gardening industries as the country’s mainstream culture was developing. Exploring the decisions of major home and garden magazine founders and plant nursery specialists, the book illuminates how companies used seed catalogs to sell the English form of gardening as a way to create social status for the emerging middle class. Each chapter explores one aspect of America’s gardening history—one details the impact of social changes on the seed industry, for instance, and another is solely concerned with the legendary rose—and each chapter concludes with a discussion of a “featured plant” from the author’s own garden. Also detailed is the rise in popularity of various plants, such as water lilies, perennials, and house plants. Brief sections on the social implications of advertising’s influence, especially on women, who constitute the majority of gardeners, may leave some readers wanting. Thoroughly researched and lushly illustrated, this book is more historical documentation than gardening guide, as it provides insight into the lasting impact of gardening advertising on American culture. In fact, the author’s objective voice enlightens readers of the truth of his thesis as he encourages readers to probe further into the way advertising has the ability to convince. The rich, gorgeous photographs of landscapes and catalogs enhance the book’s atmosphere and demonstrate the American/English crossover in nineteenth century gardening. 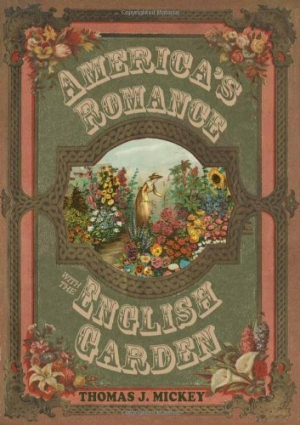 Though certainly a niche book for American history buffs and professional gardeners, America’s Romance with the English Garden will also appeal to readers interested in architecture, landscaping, design, botany, and English and American culture. Thomas J. Mickey is a graduate of Harvard University’s Landscape Institute, has been a garden columnist for numerous publications, and is a professor emeritus at Bridgewater State University in Massachusetts.